Available across all major platforms including smartphones and tablets of both Android and Apple persuasions, the Matchbook mobile app is very much worth a download for day-to-day punters. Backing and laying are made easy on the Matchbook app meaning you can do this even when you are commuting, at the game or even just lounging on the sofa. From the Matchbook website or from Matchbook mobile, skip to the bottom of the main page and click on the mobile applications link. Separate links are displayed to download the Matchbook app on Android, iPhone, Apple Watch and iPad. From there, simply click on the link and begin to download the app onto your chosen device. The process is quick and easy, the download itself taking a matter of seconds with a 3G or 4G signal. The Matchbook app offers reasonable compatibility and a good range of markets for football fans, though its range overall could do with improving. The interface is smart, very responsive and hugely reliable. The app is even available to Apple Watch and iPad users meaning no matter what technology you prefer, you should be able to get your bet on when you’re on the go. Accessing either the iTunes store or the Google Play store directly from your mobile or tablet will make the download quick, easy and painless. If downloading the app for the first time and opening a new account, you should know that it is possible to obtain new player benefits when signing up at Matchbook. To do so, simply register as a new player as usual from your mobile device. The same steps and personal details will be required as if you were on a desktop computer. Remember to enter the Matchbook bonus code when signing up to claim the best available offers. The current code is MBMAX. We’ll update this post if the bonuses should change, or if additional offers should become available. Bear in mind that terms and conditions apply, and you must be aged 18 or over to sign up and gamble legally in the UK. When clicking at first on a chosen sport, events are displayed chronologically. Events which are in-play are shown at the top and being able to bet on them live is an advantage for a bettor. The only downside is the lack of live streaming on the Matchbook app. The app gives you the power to play the exchanges on the go. If betting on football for example, simply tap the A-Z on the top left of the screen, choose ‘soccer’ and then all the latest games will appear. On the right side of the soccer section you can choose which league or cup you want to bet in, i.e. Premier League, and all available markets will be displayed super fast. The ability to be able to ‘lay’ a team, i.e. 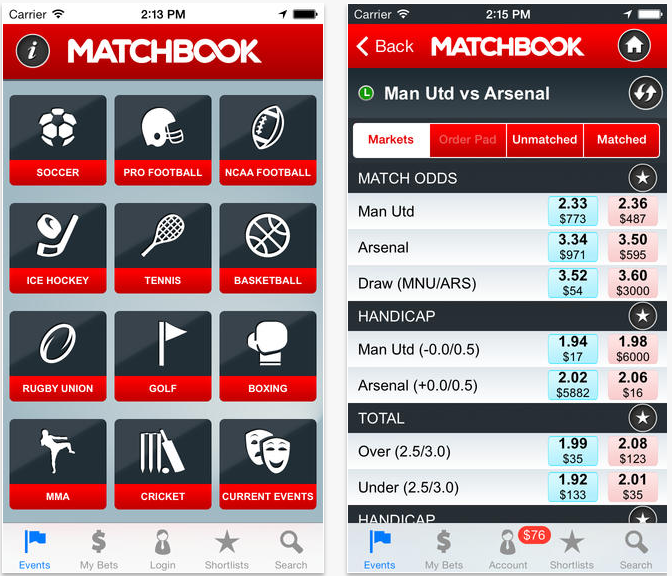 betting against them winning, gives this app the edge over traditional bookmaker apps. With a good range of markets especially on football, the app is useful and benefits hugely from its extremely quick and smart interface. From opening up the app, tapping on the desired market and placing a bet you will have spent just a matter of seconds. Yes, if you are a new customer, you should be eligible for the bonus with our promo code. Just be sure to read the terms and conditions before signing up. All new signups in the eligible territories can claim the offer. Is the app available everywhere? No, the Matchbook app is available only in certain territories. See the list on the Matchbook website. The app is quick and smart to look at so in terms of its usability there can be no complaints. It lacks a little something compared to the big boys Betfair and Betdaq though and has a little catching up to do if the app is going to take a customer from those players. At present, Matchbook offer only their standard app and have no specific sign-up or other bonuses for Matchbook app or mobile users, though the regular welcome offer applies. Simply sign up to a new account via the app, enter code and opt in to receive it.